Toyota began stripping the hidden bits and pieces of the next model of Camry in July this year. Although, the next model of Camry which is scheduled to see the dealerships in sometime around next year, however Toyota has revealed the tail-light after the release of head-light in early July this year. Today’s photo shows angular taillight, with some of Toyota’s slightly more modern design cues as seen on the new Sienna. Still, there’s quite a similarity to the rear end of the previous generation Camry. 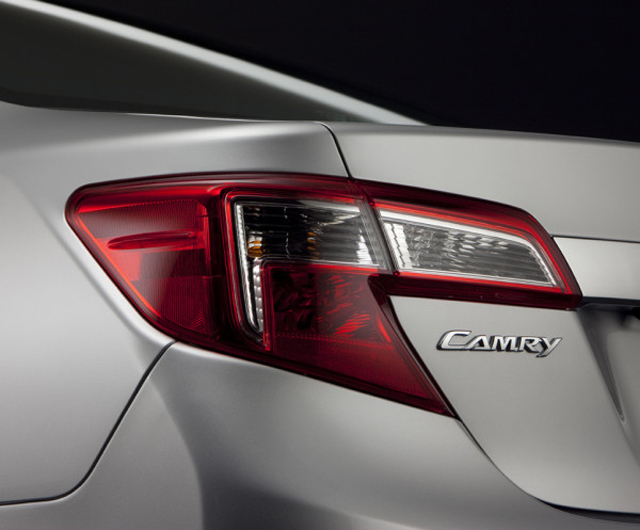 While the first image showed us the front end of the car, this latest picture gives us a cropped look at the next generation Camry’s rear end with a clear view of the sedan model’s tail lamps, which kind of remind the ones found on Subaru Legacy. Toyota’s new born alliance with Subaru was known to the world for providing the 2-liter boxer engine for the stunning Scion FR-S (initially introduced as Toyota FT-86), but it doesn’t seem that the engine is just the part of the collaboration between the two Japanese automakers as the rear-lights share a lot of resemblance as well.